As the 2015 fiscal year has rolled forward to its halfway point, we take a look at the performance of alternative mutual funds and UCITS funds. Preqin’s special report, Liquid Alternatives: Investor and Fund Manager Outlook, provides an in-depth overview of the liquid alternatives space and how it performed in 2014. According to the report, the Preqin All-Strategies Hedge Fund benchmark index returned 3.78% to investors in 2014. On the liquid alternatives side, alternative mutual funds performed slightly better, generating 4.36% while UCITS funds lagged with a return of 1.45%. 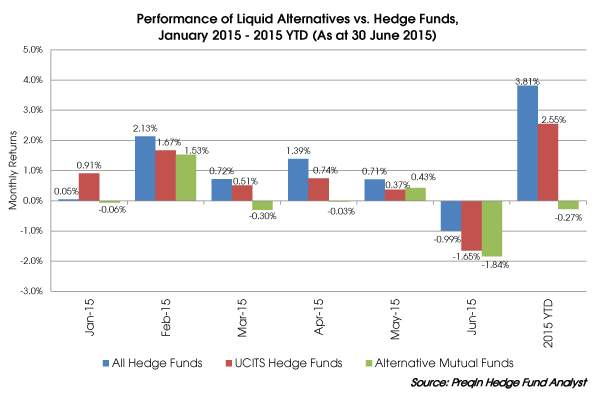 According to Preqin’s Hedge Fund Analyst, the performance of the liquid alternatives sector has shown changes through the first half of 2015. Alternative mutual funds had negative returns in three out of the first five months; however, they returned 0.53% in May and 1.30% for the year (as of 31 May 2015). Meanwhile, the overall Preqin hedge fund benchmark shows a 5.32% return for hedge funds, already surpassing 2014’s full-year returns. UCITS funds have also fared better than alternative mutual funds so far in 2015, achieving returns of 4.51% for the year to May 2015. One factor which affects the performance of liquid alternative funds is the regulatory requirements applied to these funds which do not allow them as much freedom, in terms of the instruments and trading strategies employed, as traditional hedge funds. Leverage is restricted, for example, which may reduce losses on the downside as well as gains on the upside. The limitations on strategies employed by alternative mutual funds and UCITS fund structures may impact returns, meaning that these vehicles may not generate the same performance as hedge funds. However, with lower volatility, consistent risk-adjusted returns and lower barriers to entry, liquid alternatives continue to provide a wide range of investors with a gateway into alternatives.